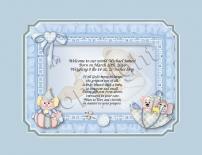 A beautiful new baby boy keepsake, celebrating the miracle of life and one of God's most precious gifts! A sweet and personal way to welcome a new little baby boy into the world. A thoughtful and unique way to celebrate the birth of a new baby girl and welcome her into the world. It can be personalized with her name, weight, and inches and with your own expression of love. It will be treasured for years to come! 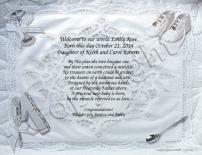 A beautiful new baby keepsake, celebrating the miracle of life and one of God's most precious gifts! Personalized with the baby's name, the parents' names, and with your name and loving sentiments. A sweet and personal way to welcome a new little baby into the world! Create a unique and personalized gift for that new baby boy that will be treasured by parents and child alike, thru out the all years of his life. 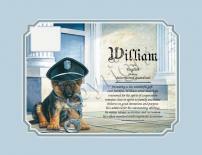 Design a personalized baby gift for that new little boy that will always be loved! 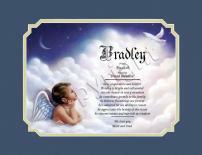 A truly unique baby gift for that new little boy--the origin and meaning of his name on a precious baby art background. A gift that is thoughtful and personal and will be treasured for a lifetime! 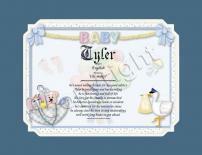 Create a thoughtful name gift for a baby boy. 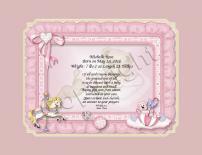 A special way to celebrate a sweet baby girl with the origin and meaning of her name on a precious art background. 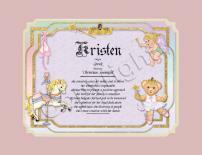 It celebrates her chosen name, and will be cherished for a lifetime! A unique way to celebrate a special baby girl. This beautiful gift represents her thoughtfully selected name, along with it's origin and meaning. A truly personal keepsake that will be treasured forever. A great way to remember the birth of that special little girl. It can be personalized with your own loving sentiments at the bottom. 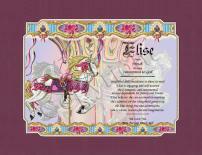 With her name in print, with origin and meaning, will be a delight to her parents and also to her as she grows up. A truly beautiful and thoughtful personalized gift!